Want to know what shortwave radio sounded like in 1974? This 55-minute recording, recovered from a cassette, was never intended to be anything but “audio notes”: I was an 18-year-old shortwave listener who collected QSL cards from international stations, and I was tired of using a pen and a notepad to copy down details of the broadcasts. I wanted an easier way to record what I heard, and my cassette tape recorder seemed like the perfect means to accomplish that goal. But it wasn’t. I soon discovered that it was simpler to just edit my notes as I was jotting them down — not spend time on endless searches for specific information located all over on the tape. To make a long story shorter, I abandoned my “audio notes” plan after a single shortwave recording: This one. Brian, this is a brilliant recording–regardless of audio quality–and we’re very thankful you took the time to share it. Propagation has left something to be desired as of late, so time traveling back to 1974 has been incredibly fun. Post Readers: If, like Brian, you have off-air recordings on tape that you’d like to share, please contact me! Even if you don’t have the means to transfer your tapes to a digital format, I’m a part of a small community of shortwave radio archivists who would be quite willing to help. This entry was posted in Guest Posts, News, Nostalgia, Podcast, Radio History, Recordings, Shortwave Radio, Specials and tagged 1974 Shortwave, Armed Forces Service, Brian Smith, CBC, Department of Energy Belton Missouri, Deutsche Welle, Hallicrafters S-108, Italian Navy Shortwave, New York Radio WSY-70, Off Air Shortwave Recordings, Radio Argentina Exterior, Radio Canada, Radio Tirana, RAE, Recordings, Shortwave Radio, Shortwave Radio Audio Archive, Shortwave Radio Recordings on August 29, 2015 by Thomas. 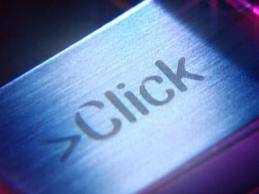 Thanks for the shout out, Click! 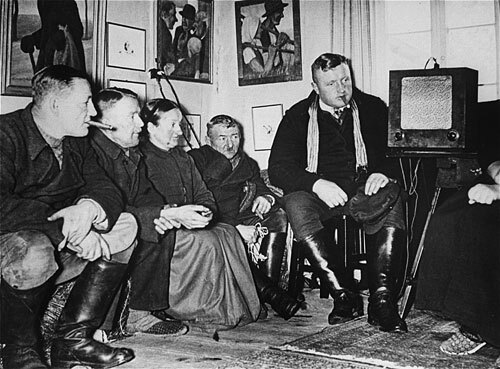 Some of you may recall this recent post about listening to the BBC World Service program, Click, via shortwave radio. SWLing Post contributor, Richard Langley, discovered that Click hosts Gareth Mitchell and Bill Thompson mentioned his shortwave research at the conclusion of the show’s most recent episode. The podcast of this episode, which focuses on the Nepal Quake Project, is available online and well worth hearing. This entry was posted in Broadcasters, News, Podcast, Shortwave Radio, What's On Shortwave and tagged BBC World Service, Bill Thompson, Click, Gareth Mitchell, Richard Langley, Shortwave Radio on June 9, 2015 by Thomas. 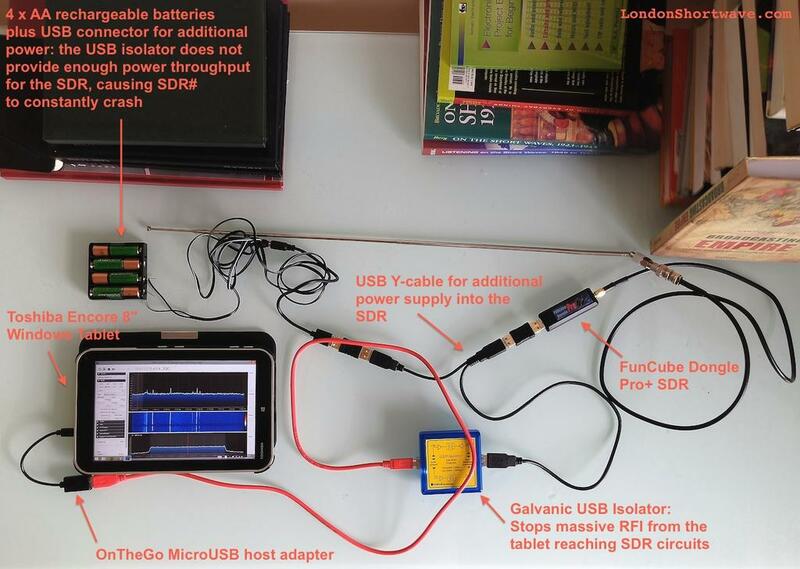 SWLing Post reader, London Shortwave, is working on a portable SDR (software defined radio) system based on his Toshiba Encore 8″ Windows tablet, FunCube Dongle Pro+, and supported by the excellent SDR# application. Today, he shared this photo of his entire kit, including his comments. If you’re interested in a similar portable SDR, take note of the USB isolator and extra (AA battery) power supply. London Shortwave plans to make an enclosure for the SDR, AA power supply, and USB isolator. Thanks for sharing, London Shortwave! This entry was posted in How To, Kits, News, Podcast, Software Defined Radio and tagged @LondonShortwave, FunCube Dongle Pro+, London Shortwave, SDR, SDR Sharp on July 16, 2014 by Thomas.